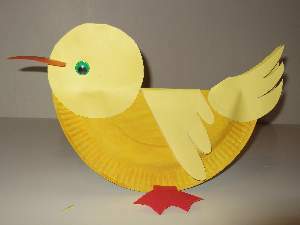 This Paper Plate Duck Rocks! 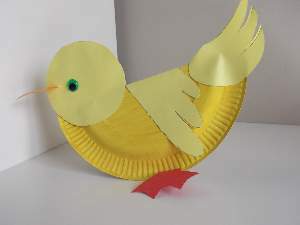 This paper plate duck won`t feel at home in the bath but you can have fun just the same making it. Just tapping on the tail will start it rocking just like a real duck that dips it`s beak and bobs it`s tail. 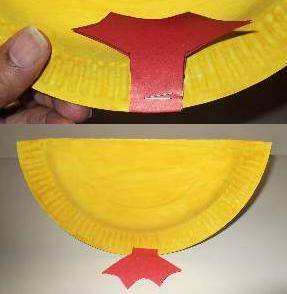 To make it, take a 23cm (9 inch) or smaller sized paper plate, fold it in half upward so that the underside is on the outside, then paint it yellow. You may have to paint it several coats if you are using poster paint. 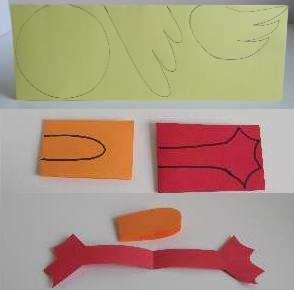 Fold an A4 yellow sheet of paper or thin card in half and draw the head, wings, and tail. 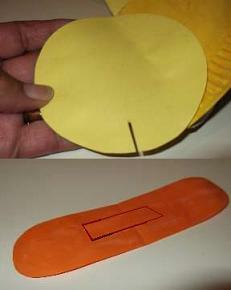 Make the duck bill from a piece of orange paper or card, and the feet from red. Take note of the position of the fold line when drawing the pieces. Copy from the illustration. When you cut the feet out make sure the top of the leg is on the fold. This will create a band with the feet attached. 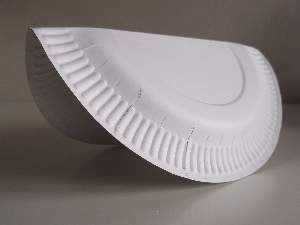 To build the paper plate duck, start by stapling the feet onto the bottom of the plate on both sides. Do not cut the feet apart. The band will keep the plate folded together. Press the feet downwards over the staples to conceal them. Leave the bottom of the head, the ends of the wings, and the back of the tail free of glue. You don`t stick them down. Cut a slot in the head for the bill. Glue a strip of paper to the inside of the duck`s bill and then glue the sides together. This will thicken the middle of it ready to insert into the slot you made on the head. Lastly, stick on some googly eyes. I have different colors so I thought green looked good. White look good too so use them by all means. 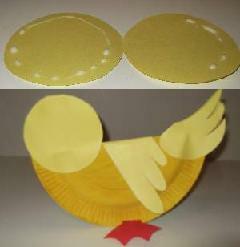 Now your paper plate duck is ready to duck and bob it`s tail as you rock it KKC style of coarse! While on the subject. I found a really nice website by a teacher that shows kids how to make the popular "hook a duck" game.